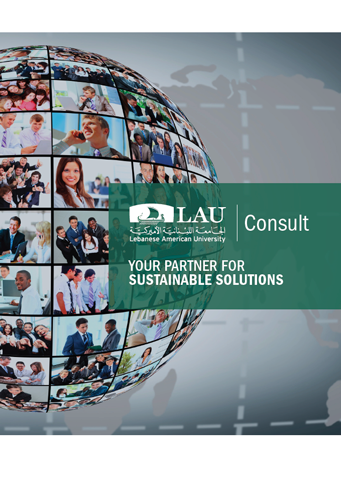 LAU Consult is the consulting arm of the Lebanese American University (LAU), operating from within the University Enterprise Office (UEO). At LAU Consult, we strive to help you gain a competitive edge in your industry, geographic market and social environment. LAU is a leading multi-campus institution of higher education in Lebanon, chartered by the Board of Regents of the University of the State of New York and accredited by the Commission on Institutions of Higher Education of the New England Association of Schools and Colleges (CIHE-NEASC). LAU hosts first-rate schools in Architecture & Design, Arts & Sciences, Business, Engineering, Medicine, Nursing, and Pharmacy. To date, LAU’s schools have achieved the following distinguished accreditations: AACSB for the School of Business; ABET for the bachelor’s in civil, computer, electrical, industrial and mechanical engineering; ABET for the computer science program; a CCNE for the BS in Nursing; and ACPE for the Doctorate in Pharmacy. From within this accomplished institution, LAU Consult strives to serve your needs with care, integrity and excellence. LAU Consult draws on the academic and professional expertise of more than 700 full-time LAU faculty and staff, as well as that of a diverse pool of external experts. You will see immediate benefits as we leverage our expertise and belief in sustainable partnerships to deliver tangible and long-lasting results.